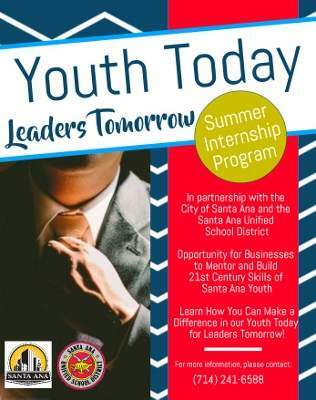 The Youth Today, Leaders Tomorrow summer internship program is a partnership between the City of Santa Ana and the Santa Ana Unified School District (SAUSD). It is a great opportunity for businesses to mentor and help build 21st century skills of Santa Ana youth. The City of Santa Ana is working with SAUSD to connecting students’ educational experience with workforce opportunities. Businesses are invited to make a difference in our Youth Today, Leaders Tomorrow summer internship program, by providing the youth of Santa Ana with engaging and valuable summer jobs. We are looking for worksites that include government agencies, hospitals, nonprofits, small businesses, law firms, museums, sports enterprises, retail, etc. The program will start in mid-June and will run for 4–6 weeks. Applications for interested employers are available now. Interested employers and youth may contact Christine or Anita at (714) 241-6588 for an application or to answer any questions.